ASK ABOUT OFF SEASON (Mid April-May) & LAST MINUTE BOOKING DISCOUNTS! 3 bedroom 2 bath cabin with full amenities. Screened in porch, grill, wood burning fireplace. Fabulous views surrounded by peace and quiet. Close to town, shopping, and restaurants. This little gem is full of charm and character. Fully furnished with a king bed in the master, great view, quality linens, cable, WiFi, central H&A, and full kitchen. Second upstairs bedroom has twin bunkbeds. There are lots of outdoor decks, a Weber gas grill, and ample parking. Small dogs are welcome and can enjoy a convenient fenced run accessible off the deck. The downstairs bedroom has full bath (shower) and is accessed by steps off the deck. It has a queen size bed with views of the lake, mountains, and the surrounding woods. DOWNSTAIRS BEDROOM AND BATH IS ONLY ACCESSIBLE FROM THE OUTSIDE OF THE HOUSE, just a few steps off the back deck. 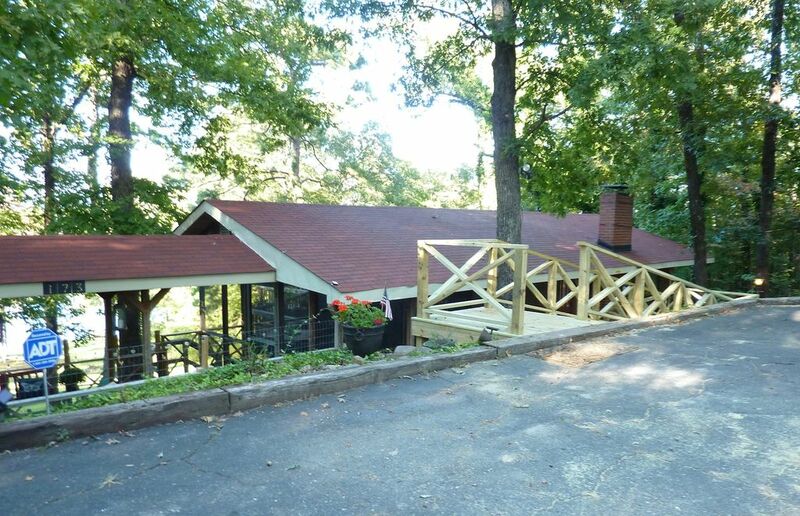 If you want views, the lake, and privacy, with a relaxed feel, this is it! I grew up in Little Rock, AR and have lived here most of my life. I love to travel and explore new places. This property offers comfort and privacy with the convenience of town, restaurants, and grocery stores. Fabulous views of the lake and mountains at this waterfront property. There is a boardwalk on the property with boat tie ups. The water is deep enough for a pontoon boat to pull up. Fishing, kayaking, and floating are wonderful in this private cove off the main channel. We could not have picked a cozier more affordable place on the lake if we tried. Only an hour from home, we did not have to go far to find this gem. Our girls’ getaway was perfect for celebrating our friend who just completed her last chemo treatment and was pronounced cancer free! This property had enough room for 5 of us to sit around and chat for hours. The porches were what attracted us to this place and they did not disappoint! Because the weather was lovely, we sat on the porches enjoying God’s creation taking in the gorgeous view of the lake. Except for the lawn mowing and the noise from the construction on a house next door (totally out of this owner’s control) we found this location to be in a setting conducive to peace and quiet. The place is exactly like the photos. The master bedroom was wonderful with a super comfy bed and a gorgeous view to wake up to. Although this house is dated a bit, John did an excellent job with decorating it to make it very unique and welcoming. It had everything we needed for our stay. Besides the amazing view of the lake, the house is situated in an area where numerous new homes are being built which adds to the charm of the location. Lastly, John was an excellent communicator and was easy to reach at all times. We would love to come back! I’m so glad you guys enjoyed the lake! What a great reason to celebrate! We look forward to having you guys back. We really enjoyed our stay at the Artist’s lake loft. It is close in but in a fairly secluded spot on Lake Hamilton. If you know Lake Hamilton you know that is a rare and wonderful thing. The house is pretty compact, but the screened-in porch and series of lakeside decks make it much larger. Great light-filled master bedroom with door to deck. Well appointed separate suite with full bath underneath main floor also faces lake. Bunk bed room has in room sink. The kitchen is small but sliding glass door to screened in porch expands the space quite nicely. We were 4 jumbo dudes down for the Rebel Stakes and the property served us very well. This place has character. We loved John's home and had such a relaxing weekend! The home is quaint with a ton of character.The lot itself is secluded and fun to walk down to the private dock from the yard. The outdoor fountain on the main deck was a particularly nice touch and was amazing to listen to that while the lightning bugs came out every evening! Great spot for a lake cabin getaway for the family! We wanted a spot on the lake to relax and grill while tubing and enjoying the lake. I would recommend renting a ski pontoon boat from Kahuna Bay before your arrival as they do rent out quickly. Our teenager loved the bottom bedroom/bathroom area all to herself. The smaller kids loved the outdoor tv area, and the view is just fabulous. This is a quirky cabin, we got a kick out of all the artsy decor, and it was a cool place to relax after hiking the trails at Lake Catherine and touring Hot Springs. Will be back! We enjoyed this unique house and had a nice fire with s'mores on the last night! We loved every minute here! We brought all of our teenagers here last weekend and we all had the best time. The screened in porch was so lovely the night it rained. Waking up in the master bedroom to a wall of windows showcasing the lake was awesome too! The kids all loved the game selection and it was nice to see them off of their phones, even as they fleeced each other in poker 😉. We will specifically stay here again. Thanks, John, you were great to work with!